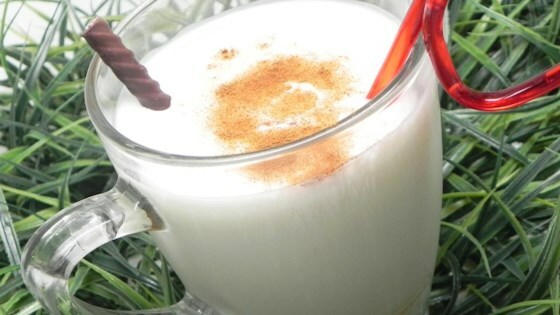 "I have made this eggnog recipe for the Christmas holiday for over 25 years. Enjoy!" Beat egg whites in a glass, metal, or ceramic bowl until foamy. Add 1 cup sugar gradually, continuing to beat until stiff peaks form. Lift your beater or whisk straight up: the egg whites will form sharp peaks. Beat egg yolks and remaining 1 cup sugar in a separate bowl until frothy and lightened in color. Fold egg whites into egg yolk mixture gently; pour into a large punch bowl or pitcher. Stir in rum, half-and-half, and milk. Top eggnog with nutmeg; serve with ice. Substitute heavy whipping cream for the half-and-half, if desired. I liked this and it had the perfect amount of booze for us. Most call for more than one type which gets a little confusing. This blend was great!